Our family drinks a lot of water. Emma and Ethan drink a little milk and mostly water. We have been encouraging them to fill their water bottles when they need a drink. Unfortunately they are short people and filling their cups and water bottles at the fridge usually ended up in a watery mess down the stainless front of my fridge. Primo Water offered to send us a bottom loading water dispenser. I have always wanted a water dispenser but disliked the look of the bottle on top and I really didn’t think I could put the bottle in myself. After reading about the bottom loading dispenser I was excited to give it a try. When it arrived I was impressed with the clean contemporary look of the chrome front. It matched our kitchen appliances nicely. I was impressed with and I loved how easy it was to slide the bottle into the bottom compartment… no lifting or flipping the water bottle. This particular dispenser allows us to have fresh, safe, hot or cold water instantly. 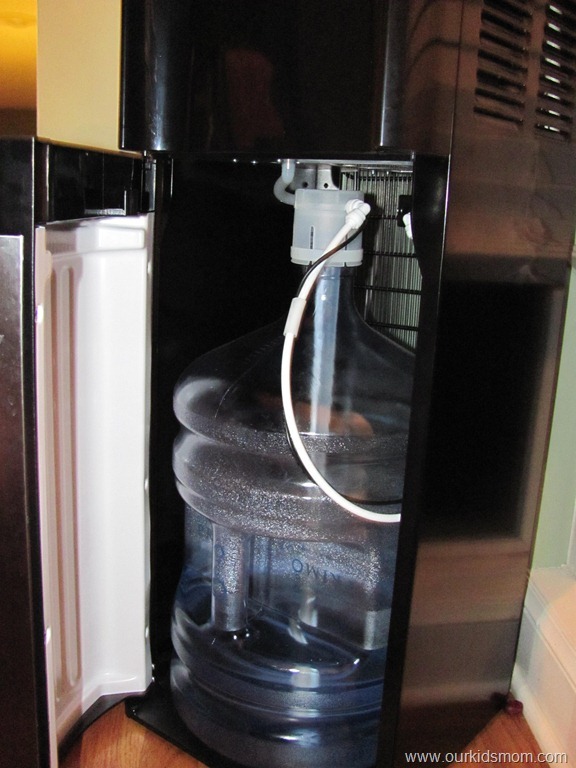 If you are a household that already purchases bottled water, using this dispenser would help eliminate having to dispose of single-use plastic bottles. Note: This device intended for dispensing water only – do not use other liquids. Emma and Ethan have enjoyed being able to fill their own cups/water bottles without making a mess (and freaking mom out). I’ve noticed the water consumption in our house has increased because of the ease of dispensing and that makes me a happy mommy. 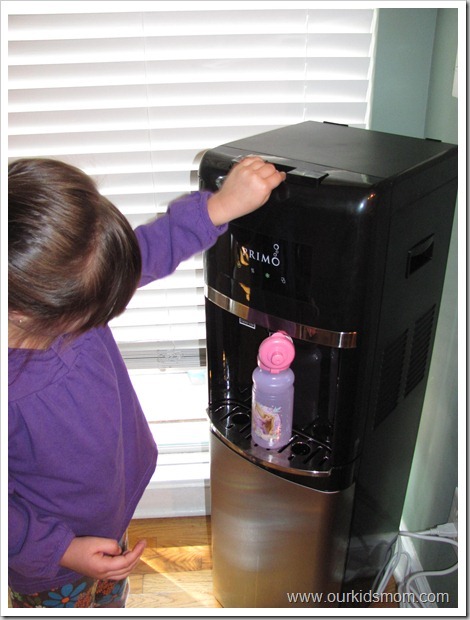 We love our dispenser and the convenience for the children to serve fresh filtered water for themselves. This will allow them to feel independent and stay hydrated at the same time. The size of the dispenser allows us to tuck the dispenser in the corner and it’s not in the way at all. Having hot and cold water at the touch of a button makes the water more palatable. I was a bit worried about the hot water button. We had a “talk” with Emma and Ethan about what buttons were okay to push, but there is also a child lock on the red button. If they were to try to push it the hot water wouldn’t work. The cost comparison of a 5 gallon bottle to a package of single serving bottles will win you over. Inside the Primo Water dispenser box is a $5 off coupon to use on your initial bottle purchase. When you return to the store with your empty bottle you receive a ticket that will allow you to purchase a full bottle for only $6. To find a retailer of Primo water near you click here. My local retailers include Wal-Mart and Lowes. This is a great savings and super convenient. If you don’t mind having to be a little careful with your full bottles you can refill your bottle even cheaper. Inside our local grocery stores, Wal-Mart and outside our gas station up the road are refill stations. We brought our 5 gallon bottle and refilled it for $1.75. 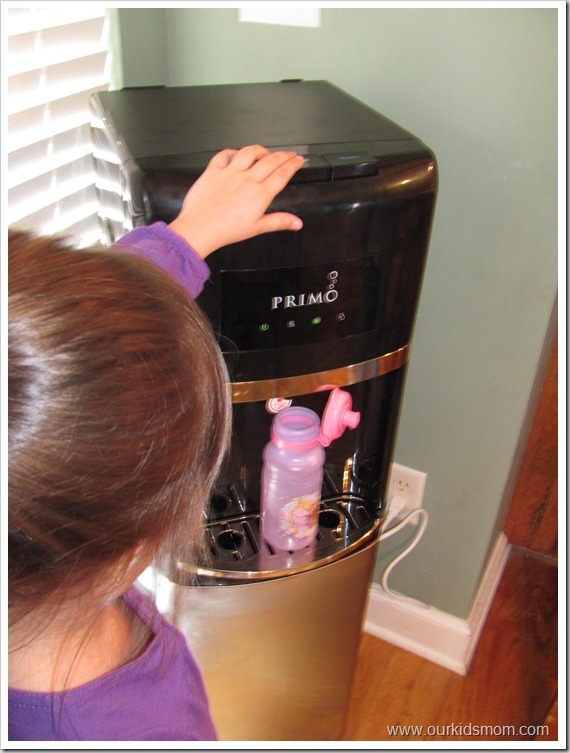 ONE OurKidsMom reader is going to win a Primo Bottom Loading Water Dispenser! This giveaway ended at 11:59 PM EST on December 19, 2011. Love that it’s bottom loading. Cool feature! You can survive for up to a month without food, but only five to seven days without water. I’d love the 900116 top loading dispenser. I like the Primo Water Pump withe the handle (900179H). I like the bottom loading. I can’t lift the bottles. I did not know water coolers come in stainless steel. I learned that 60% of the US population drinks bottled water – me included! I love the 900116 top loading dispenser. Love that the bottle is hidden and how easy it is to load it! The Primo Flavorstation looks like it would be perfect for my house. Three picky children and I’ve always been weird about my water. I LOVE that it is bottom loading!!! Also, the flavor station 500 is cool. Can’t wait for it to come out. I like that you can load it at the bottom! I like that is is bottom loading! Thanks so much for the fantastic giveaway! I want the Primo Flavorstation. I like the Primo Water portable dispenser. I could certainly make use of it!! I learned it dispenses cold water twice as fast as other brands! I REALLY LIKE HOW THEY HAVE THE Flavorstation 500 🙂 LOVE IT!!! I like that the bottles are on the bottom. I have to load the one at work and it just about kills me. This I could do. I learned that Primo uses a 9 stage purification process. Hello, I learned that 75% of Americans are chronically dehydrated. Wow, I didn’t know it was that high. Thanks for a great giveaway! I LOVE that the bottle goes on the bottom and no more spills trying to get it up top! I learned that Primo Water Corporation was started in 2004 by Billy Prim. love that it is bottom loading and that you don’t see the bottle. I like that they have a handle. I like the Primo Water portable dispenser. I also like the “Flavorstation 500”. I love flavored water & would LOVE the Flavorstation. I love the bottom loading feature! I learned that they have portable water dispensers too! You can get 3 or 5 gallon jugs! I learned they have a portable one too! I learned that Lowe’s sells their products. Good to know. I like the flavor station and all their flavors for sparkling water. I love this site. Even if your drinking water looks, tastes and smells good, chances are it contains one or more contaminates—and you can’t tell. I also like the 900179H Portable that will hold 3-5 gallon bottles. We go camping a lot, and this would be great to take along! I like that they have the energy star ratings! I like that they are available at so many locations. I like the Flavorstation 100. 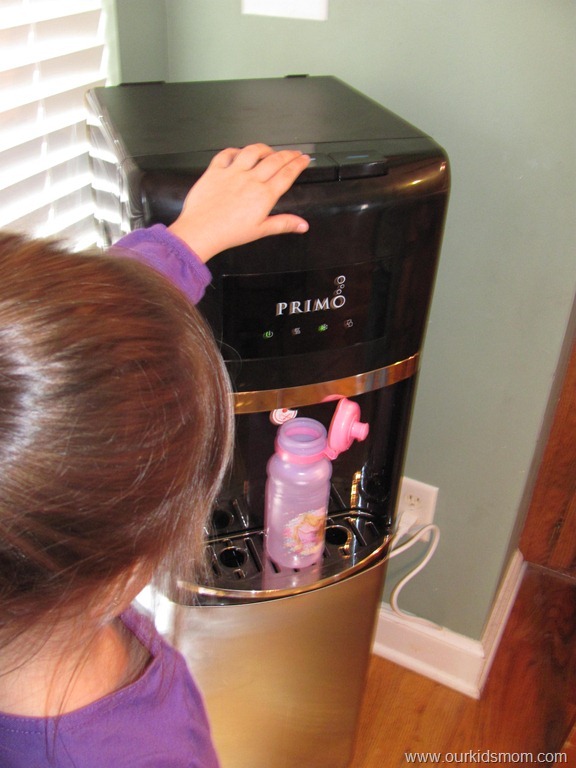 I learned that Primo Water is purified to the highest industry standards using a 9-step process that includes sand filtering, carbon filters to remove chlorine disinfection, reverse osmosis or distillation, micro-filtration to remove very small particles and microbiological constituents and then ozonation to ensure the water is completely disinfected. I love how you will reduce the amount of plastic bottles that end up in landfills just by using one! I learned that you don’t have to have an eyesoar water bottle on top of your water cooler but rather nicely tucked away underneath. Their system has zero waste. I like the water dispensers with stainless steel accents! I really love that it is a bottom loading machine! I would love to take this to our church/school (work) staff room! The church water is super icky because od old/black pipes and I won’t touch it! Which means I’m always carrying a giant nalgene full of water from home! I’m also prone to kidney stones so I should be drinking more than one nalgene a day, but I’m NOT carrying TWO 32oz bottles each day! I love their filtration process, seems very thorough. I want the soda maker machine! Energy Star Rating!! LOVE IT!! I like that it’s bottom loading so I don’t have to lift the bottles! There’s so many plastic bottles that are kept out of the landfill when you use this. learned they have energy star rating! I love that they are all Energy Star rated! I also love the Flavor Station 500! I learned that you can find them at Lowe’s. I also like the Flavorstation 100. That primo Flavorstation looks pretty neat too! Wow–I really like the Flavor Station 500! I love the portable water dispensers too! Especially 900131 model. They also have beverage makers for flavored drinks. Bottom loading….what a back saver! I also like the Top Loading Dispensers. Bottom Loader and learned about its stylish design combined with bottom loading technology make this dispenser an attractive and valuable addition to any home or office. 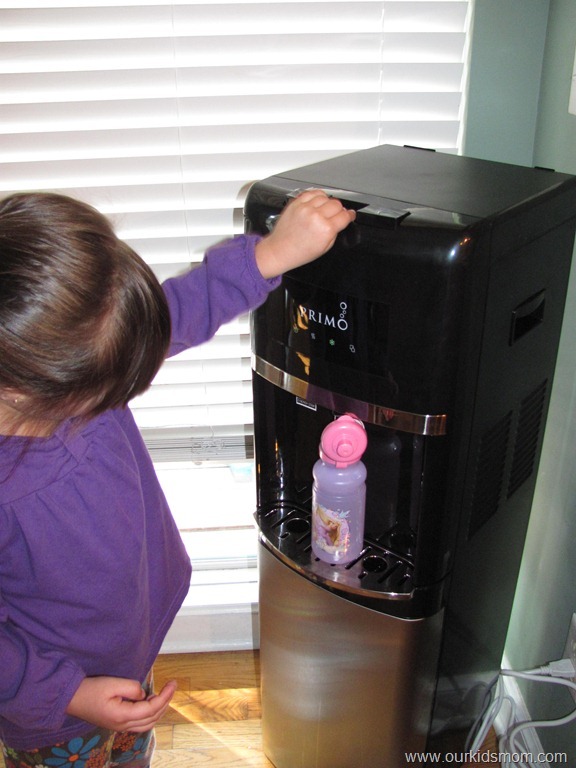 Owning a Primo water dispenser allows you to enjoy hot or cold purified water at the touch of a button while helping to eliminate thousands of single-use bottles from our landfills. this water cooler looks like it will be the best. I like the portable water dispenser! I learned in the last 5 years they have kept 370,000,000 single water bottles from the landfills. I learned that Primo Water is bottled locally at over 60 locations nationwide using a 9-stage purification process. 9 stages!!!! That’s gotta be pure h20! I learned that this is now available at Lowes. Love that it’s bottom loading. I like the fact that there are Primo Sparkling Beverage Mixes for the water. Great idea! I also love the Flavor Station 500! I like the bottom loader you have in the post. Besides that one, I also like the Flavorstation 500, and the Primo Sparkler. Bottom loading makes it easier to use! I like that they also offer different flavors to add to the water. I think that would help get my kids to drink more water. I would like to get the flavorstation 500 when it comes out! the bottom loading feature is great! I’m always scared when i have to change the top loading ones at work! At Primo we take our responsibility to the environment seriously, and we are dedicated to reusing, recycling and reducing waste. When we say our bottles are “Zero Waste,” we mean just that—they produce zero waste. I like that you don’t have to lift and tip the bottle. I learned that the product is available at Lowe’s, just around the corner from my house. I want the cool Primo Flavorstation 100! 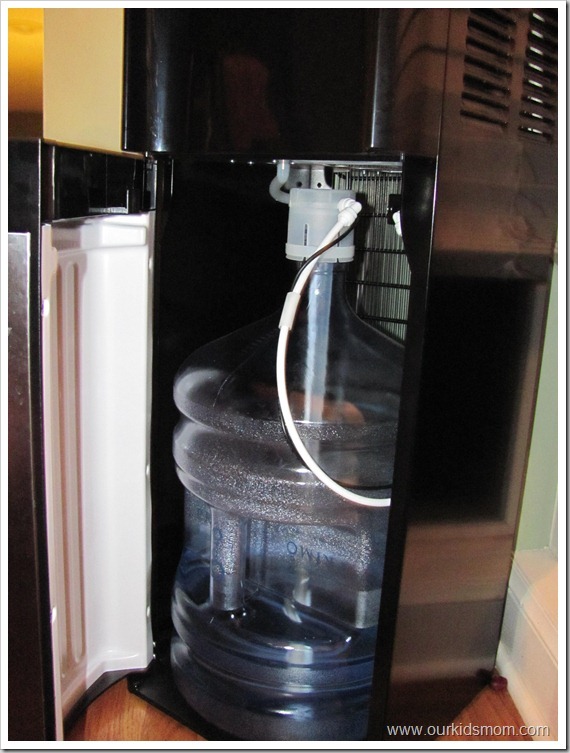 Thanks for the giveaway…we like the Water Dispenser > Portable > 900114 ! I would like to try the Primo Sparkling Beverage Mixes!